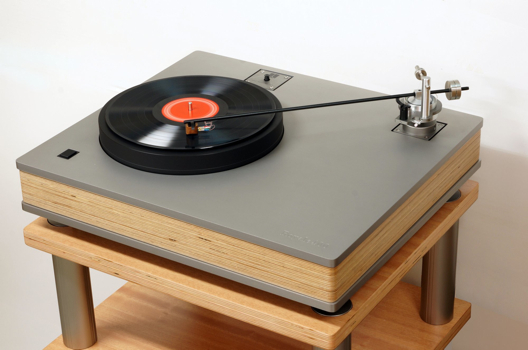 Which Well Tempered turntable is right for you? Since the introduction of the Well Tempered Amadeus turnable around 4 years ago, WT Labs have expanded the range in both directions. The Simplex was introduced as an entry level version. The original Amadeus has enjoyed subtle revisions and upgrades and now with the introduction of the Symmetrex tonearm is officially MK2 . The better Amadeus GT has morphed into the GTA version - the acrylic plinth being replaced by a more massive and seriously engineered composite aluminium version. And now features the top of the line LTD/Symmetrex tonearm taking it's performance well beyond that of the standard Amadeus. As a more organic alternative to the Amadeus GTA, the new model VERSALEX is also upgraded with the Symmetrex. The plinth is a 'Baltic Ply' - in other words just like that used in Shahinian speakers which has some rather nice acoustic and mechanical properties - it's finished in a handsome walnut veneer. The motor, platter and bearing may be identical to the Amadeus components but the Verselex has its own distinctive character. At the top of the Well Tempered range is the new ROYALE 400. This represents the culmination of all the Well Tempered technologies. If you've ever read about overseas high end audio shows, you'll be well aware that there are some spectacularly expensive and massive turntables out there. We'd wager that the Versalex or GTA will give any of these a run for their money but there is an obvious demand at the luxury end of the market. Hence the Royale, which certainly looks the part. What sets it apart from others is the radical approach to the tonearm - it's a full 400mm long. This would be a recipe for disaster if conventionally engineered, but in the Well tempered world it makes perfect sense as it solves several geometric and performance compromises that all shorter arms share. Add to this the massive composite plinth and what looks like a heavier platter system and there is everything to suggest that, assuming the rest of your system is up to it, that the Royale will deliver a definitive analogue performance. Yes - it is expensive. But to keep things in context, it will last a lifetime and give endless hours of enjoyment. Cars and boats consume considerably more dollars, both in purchase and ongoing costs, and have far shorter working lives. For the serious vinyl enthusiast, the Well Tempered Royale is a dream you can actually own. In terms of straight 'can I even afford this' economics the Simplex does tick all the boxes - you get the benefit of technologies introduced in more expensive turntables, many of the same components (bearing, motor and tonearm) and still have plenty of room to upgrade. The Simplex is perfectly at home with a good budget cartridge - the Nagaoka Cartridges are a happy match. But will really sing if you want to improve on the cartridge later. Likewise the addition of the DPS power is also worthwhile - while a cartridge will have a finite working life before stylus replacement, the DPS will be a permanent addition and so would take priority. A Simplex sounds fantastic - far better than even a highly tricked up Pro-ject or well maintained Linn, so if you are on a budget but really want to enjoy your records, the choice is, dare we say it, simple. But - if you are in a position to be considering the Simplex plus DPS and splashing out on a cartridge upgrade at the same time we really advise that for the same amount or less you are better opting for the next model up - the Amadeus. The Amadeus is better - the larger platter gives better rotational stability, the sandwich construction of the larger plinth aids damping and improves the solidity of the sound. While the design principles are the same, the Amadeus Symmetrex tonearm has more solid components and the mounting system for the golf ball lowers the centre of gravity and improves stability. In short the Amadeus is a superior platform for any cartridge and will reveal more than the Simplex. The addition of the DPS power supply makes a subjectively bigger improvement to the Amadeus than the Simplex because the initial level of transparency is greater, so there is more revealed by improving the motor drive. Introduced in 2008 the Amadeus was immediately recognised as a design and performance classic. Now in MK2 form it's even better. The transition between standard Amadeus and the new GTA version is even greater than the step between Simplex and Amadeus. The weightiness of the plinth can only be appreciated when setting up - a combination of this extra mass, the acrylic/aluminium combination giving the best of all worlds plus much greater rigidity (but is still highly damped). The new LTD/Symmetrex tone arm is a huge step up.Theses enhancements yield improved solidity and definition in the performance. While we like to think everyone will take perfect care of their turntable it is a fact that the aluminium slabs are also very hardwearing. So of all the WT models, it's the Amadeus GTA which will deal with continuous use and look like new for years. With both Simplex and Amadeus, the fact that the arm is well damped by silicon makes the provision of a cuing device superflous - if you drop the arm the motion is smooth down onto the record - the speed is dependent on how much damping is in contact with the golf ball and tracking force applied to the cartridge. That said, you'll find a built in arm raiser on the LTD arm fitted to the GTA and Versalex models. Likewise with antiskate provision - the twist in the monofilament that the arms are suspended from provides antiskate force and this is also damped. The Amadeus GTA is the purist Well Tempered, while the new Versalex shows a more traditional aesthetic with the wood plinth. For some, the choice will come down to personal preference in how you think a turntable should look - I'll admit to a bias towards the sharp minimalist lines of the GTA while many others will prefer the more organic feel and sound of the Versalex. It is more a qualitative difference whereas between the more basic models there are clearly defined quantitative differences. The Versalex is an unashamedly analogue device with all the goodness that this implies. Within the Well Tempered universe there is another specialist option. The DV 500 turntable is a William Firebaugh design to facilitate a high performance and stable platform for the Dynavector 507 Tonearm. 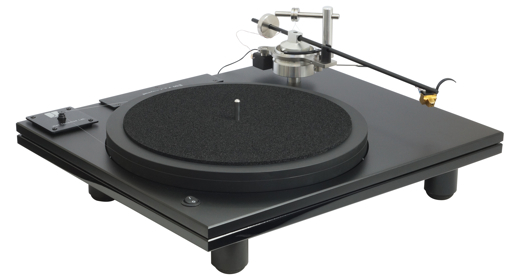 Effectively an Amadeus GT with an armhole appropriate to the 507 and without the extras for the WT arm, this turntable provides a synthesis of two unique approaches to vinyl replay - The Dynavector Tone arm is radically different from any Well Tempered device but has a formidable reputation among audiophiles. If you own or have access to this tonearm, or simply want to build an effectively bespoke analogue system, then the DV500 is a viable option. Likewise if your tonearm shares the mounting geometry of the 507, you may well have found your new turntable. "The Symmetrex tonearm has the unique feature of dynamic tracking. The centre of gravity of the tonearm assembly is well above the rotational pivot of the ball and the ball is immersed in approximately 30% in the damping fluid. When the stylus encounters heavy modulation in the grooves the increased drag causes the tonearm to rotate down thus gently increasing the tracking force maintaining a secure and stable condition for every cartridge" - William Firebaugh, Chief Engineer. On the face of it, what seemed to be a simple exercise of just shifting the pivot points on the golf ball, was not quite as simple as it may seem. Converting William's conception and prototypes to a final conclusion required us to totally re-think the original design, altering the pivot points on the golf ball meant that the arm pillar required extending to a ridiculous height which was not practical. Instead we have managed to retain the ubiquitous golf ball and all the exact same features of the original with the added advantage of extreme track-ability over even the most torturous groove modulation. 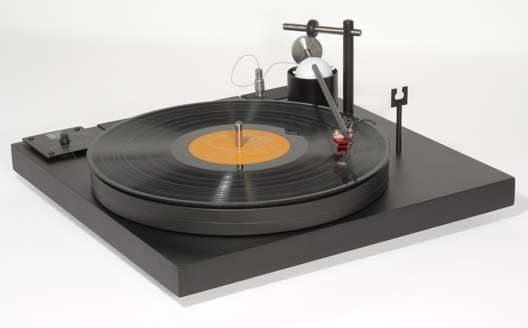 The good news: The Symmetrex tonearm is retrofit table to all Amadeus and Versalex models. 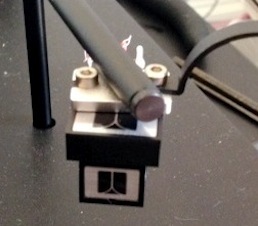 The Simplex is the exception, the Symmetrex tonearm is not compatible with Simplex. The LTD tonearm is a fully independent unit that will fit on many other turntables but is the natural compliment to the Versalex. It actually has an almost conventional arm lift cuing mechanism but still retains the trademark golfball and silicon damping bath. The sockets for attaching your choice of arm cable are integrated into the body or the arm support. The Versalex comes fitted with the LTD/Symmetrex tonearm and it's not envisaged that you'd use any other on it. Conversely, the LTD tonearm can be fitted to non-WT turntables. The new WTL RIAA Phono stage. In keeping with our program of audio socialism we now bring you an absolute ripper of a phono stage from no less than the esteemed Well Tempered Labs for NZ$680 - Well Tempered Labs are all about bringing high end analogue performance to the masses. 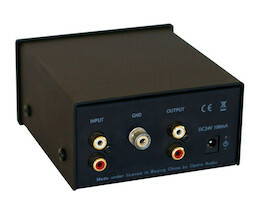 The RIAA Phono stage is gusty little box finished in the same style as the DPS power supply for the WT range of turntables, but is about half the size. It runs off 12v DC (which the DPS is set up to provide) but can equally well be used with any decent plug in supply - Tivoli units are perfect. It is specifically designed for moving magnets such as Ortofon, WTL's own TLC cartridge or high output MC cartridges like the Dynavector 10X5. For low output Moving Coil cartridges go straight to the latest Dynavector P75Mk3 phono preamp or Pure Audio Vinyl. What makes the Well Tempered phono stage so special is the sound - it's a wonderfully solid and warm presentation backed by real power and drive. We don't know the back story behind the design but it's immediately obvious that this phono stage gives a full scale analogue performance from even modest cartridges. It comprehensively blitzes anything else we've tried at this level - both the well regarded Pro-Ject and Cambridge units sound threadbare by comparison and it betters plenty of far more costly units on MM. The WT phono stage is easily the biggest and best value upgrade for the performance of 90% of turntables out there - the logic of placing more resources in the phono stage than cartridge has always been compelling to us - styli and cartridges quickly wear out and need replacement to maintain sound quality, but a good phono stage lasts a lifetime and makes easily affordable cartridges sound far better than they have any right to. Well Tempered’s new 'TLC’ moving magnet phono cartridge at NZ$ 810 is an obvious choice but also a great option for just about any other turntable. Then there is a coincidence of design and thought (and often distribution) between Dynavector and Well Tempered, so this pairing is not uncommon and never fails to work very very well. With a model range spanning 8 models from around NZ$700 to over $12,000 you have plenty of options and no real ceiling in terms of performance. As an entry level to get you started you’ll find the new Nagaoka from just $180 will sound far better than you would expect at this level. While you may have been schooled in the criticality of matching cartridge weight and compliance with specific tonearms, the Well Tempered design renders these concepts redundant. With no bearings, effectively infinite variability in damping and easy adjustment of geometry and tracking force, the WT arms in all three models are more than just compatible with virtually every cartridge made - they will extract more performance than you would have thought possible. Low cost cartridges will work at a level better than their designers probably ever hoped for. But at the same time the WT design as a whole will make the differences between cartridge models far more obvious. So every extra $100 you might spend on a cartridge on a conventional turntable will deliver far more on a Well Tempered model. So, assuming you have all the other parts of your analogue chain sorted, there is every reason to select the best cartridge you can. There is also absolutely no reason why you can't use any favored existing model as well. Compared to all the other turntables I've owned and set up the WT is very easy although because it is unconventional you do have to start by reading the manual - I've done a fair few of them now so have probably got a bit blasé but on the other hand I'm always happy to answer questions. Over half the units we've sold have been out of town so the client ends up doing all or most of the setup - I quite often fit cartridges but because you can fit them in the arm while it's mounted (in fact this is the recommendation), just as many do it themselves. Most of the adjustment on the WT can actually be done while playing so you can hear what happens as you change things - this is very cool. All of the models come with electronic stylus scales so you can easily set tracking weight. Antiskate is automatically set. The cartridge position likewise - so you'd only really be adjusting VTA - ie the height of the back of the arm (we normally try to have the arm parallel to the record surface) and the amount of damping. In many ways it's better not to be experienced - this means you'll actually read the manual and follow the instructions which is what really works! Simplex - NZ$3000 including arm and basic power supply. Amadeus MK2 - $4000 including new Symmetrex arm & power supply. Versalex - $6000 including LT/Symmetrex D tone arm. Amadeus GTA - $7000 including LTD/Symmetrex arm. DPS Power supply - $650. LTD/Symmetrex Tone arm - $2030.